The European Research Council celebrates its 10th anniversary this year, having funded about 7,000 research projects totalling about €12 billion in funding to just under 1,000 receiving institutions so far. What does all this activity look like from a visual perspective? 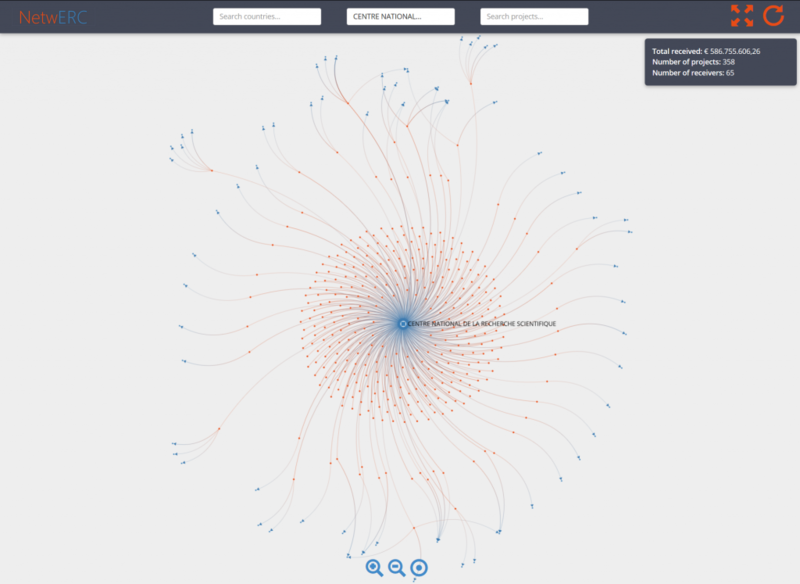 The interactive application NetwERC allows you to visualize activity by country, receiving institution or project and build networks on the fly. Data on the European Research Council’s (ERC) funding is readily available as part of the CORDIS FP7 and Horizon 2020 datasets on the European Data Portal. For this analysis, we combined the data for FP7 and H2020 to be able to gain an overview of all funding since 2007. In some cases, the names of institutions in the datasets are written in multiple ways (e.g. ‘Max Planck Gesellschaft’ vs. ‘Max-Planck-Gesellschaft’) – the data was therefore cleaned to fix this. 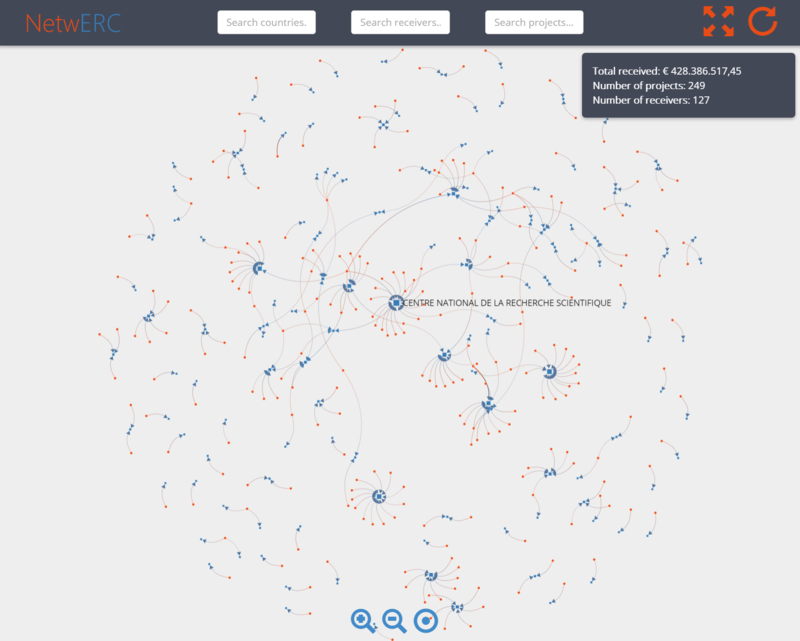 The data was converted into networks showing the links between research projects (in orange) and their related institutions (in blue). 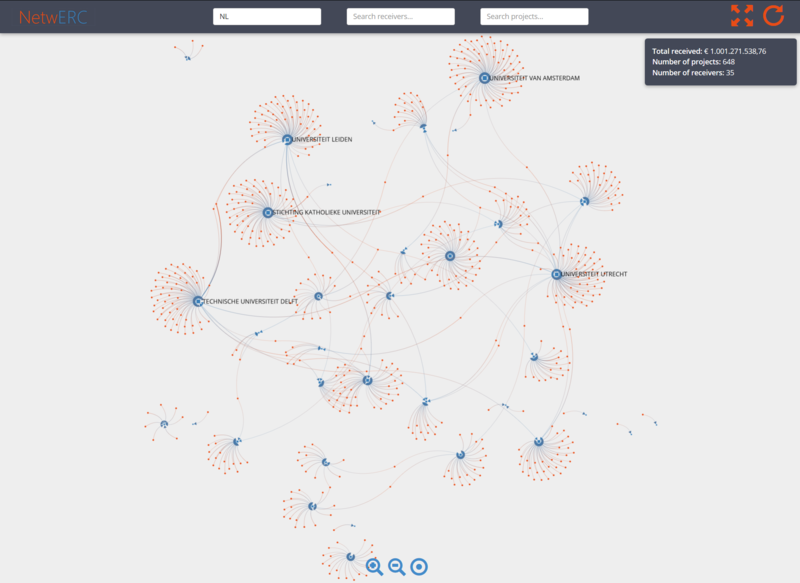 The size of the nodes reflects their number of connections in the current visual; the size of the links reflects the total funding received. As an example, let’s take a look at the impact of ERC funding in the Netherlands. Simply pick ‘NL’ from the ‘Search countries’ search box and you’ll see a network of 35 institutions and a total of 648 projects emerging (as in the picture above). The box at the right shows us that altogether, Dutch institutions received just over €1 billion in funding. Clicking any node or link shows you more information: for instance, clicking a project node allows you to view a link to its project page on the EU’s CORDIS pages. When you want to empty the drawing area and start over, just click the reset button at the top right. Questions or feedback are most welcome! Just drop me a line on Twitter (@Andre_Vermeij) or send an e-mail to andre.vermeij@kenedict.com.